To reduce our Carbon Footprint as a business we will no longer be sending a color copy of your invoice in each package, a copy of your invoice is available in your Etsy account under purchases. If you must have a printed copy of your order in black and white please leave me a message and I will be glad to send you one! Thanks for understanding, lets all do our part! Domestic orders will be shipped via USPS either First Class Mail or Flatrate Priority mail. International orders will ship International First Class or Priority International mail. Please allow 2-7 days for HANDMADE/MADE TO ORDER ITEMS to be made. If you would like your package priority please convo us for a quote. All beads will be mailed in a bubble mailer and securely wrapped in bubble wrap so they reach you in the condition you purchased them. 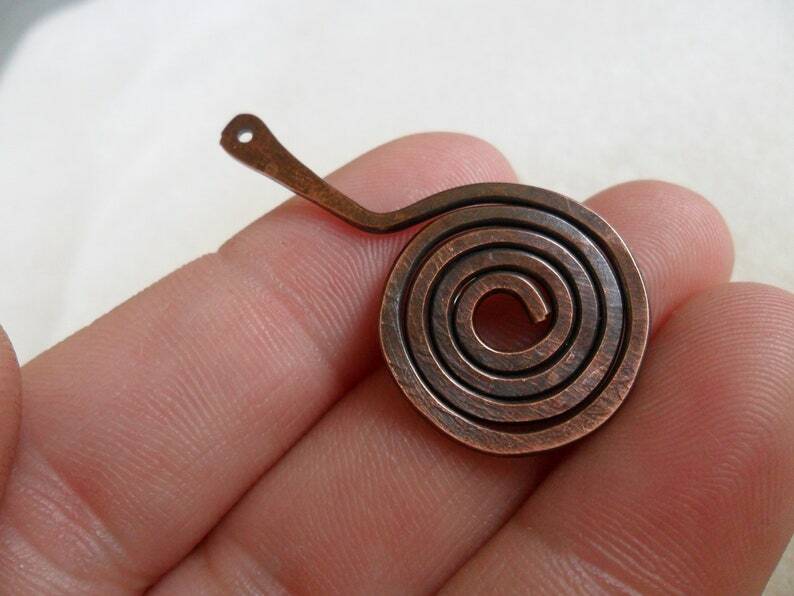 Elegant little spirals arrived promptly. Nice quality products. Will do business here again. Lovely clasps, so well-made. Outstanding finish, also a perfect size. Thank you! We now except credit cards and Etsy gift car directly through etsy, fast and easy to use! We accept Pay Pal. You don't need a PayPal account to checkout with PayPal, you can checkout as a guest. PayPal is also the safest way for you to pay! If you pay via an echeck payment can up to two weeks to clear. We will not ship your order until payment has cleared. We accept returns in the same condition they were sent out in, shipping is NON REFUNDABLE . Before we accept a return the order must be cancelled here on etsy(there is still a record on paypal to protect you and you can file a claim up to 30 days after a purchase) I will start the cancellation process as soon as you agree to a refund/return. Once we receive the items back (tracking is required, and please wrap the items in the same manner they were sent to you so they arrive safe) we will refund the entire cost of the items to you via Paypal refund. When you purchase from Beading On A Budget you agree to MY TERMS LISTED HERE! *We DO NOT start work unless paid in full upfront(via paypal or direct checkout) Once your payment clears we will start/order any supplies needed. * I will discuss the turnaround time with you before you pay so we are in agreement. Most times 1-7 business day(we don't work on weekends or holidays, including PAGAN/WICCAN holidays). For very large order it may be 1-3 weeks. * Should you decide to cancel after I have started on your order, you will be charged for the work completed already and I will ship what is done to you. Please make sure you want to order before doing so, this will make our transactions smooth. * I will ONLY ACCEPT RETURNS OR OFFER A REFUND IF I MADE A MISTAKE IN YOUR CUSTOM ORDER. When you submit a custom order please include the following in your request. * I need to know what size you want. Please feel free to ask questions I am always happy to help when I can with ideas. * How many do you need? * When do you need them by? We ship via USPS 1st class on most packages which includes tracking(in the USA only), insurance is the buyers choice(please add $2.00 for insurance if you want it along with a note). Q. How often do you ship? A. We ship Mondays-Friday. Your order (non handmade or custom items)will ship within 48 hours unless otherwise stated in the listing or in the case of custom work (excluding weekends). A. I ship via USPS. Q. Do you offer shipping discount for multiple purchases from your shop? A. Yes, I do. Each listing shows the multiple discount rate. The discount can be viewed when you scroll down to Shipping Fees. Current shipping rate for domestic orders, first class mail is $4.00. Q. Which shipping address do you use, PayPal or Etsy? A. I ship to your Etsy address unless otherwise requested, also note that we use the recommended address that usps.com provides. A. Beading On A Budget is an International Friendly shop. I Welcome all International Buyers! Q. Will you mark the Custom form as a "Gift" upon request? A. No, all Custom forms are marked as Other or Merchandise. There can be no exceptions since this is a law that could have serious consequences if not followed. Q. If I encounter custom fees on an International shipment, do you the seller pay for those? A. No, International customers are responsible for all fees, taxes, and duties associated with shipping to their respective countries. Q. How long for Delivery of purchases? A. Please allow fifteen (15) days for most domestic packages to be received and forty-five (45) days for international packages. All donations will be used on trees and other jewelry to help low income families or other autism related charities. Complaints: please convo us if you have any issues, have not received a package or have any complaint. Please allow a 24 hour period for us to respond. What would you like want made? What metal/stone/bead type if any? Do you have an example picture,if so please attach with your message? When will you need it by? What size(in inches or mm please)? If there is another size you would like that is not available please convo me..I may be able to make something custom for you. *Use a soft cotton cloth to polish your beaded jewels. A coarse cloth may scratch glass, pearls, crystals and some metal beads. *It is a good practice to wipe body oils, makeup and hair spray from jewelry after each wearing. *Put jewelry on after: bathing, applying body lotions, perfume and hair spray to avoid build up and damage from ingredients used in beauty products. *Do not sleep with, swim with, play contact sports or work near machinery. *Copper, Sterling and Nugold Jewelry WILL naturally tarnish over time. This is normal. Keeping Jewelry stored correctly is key.